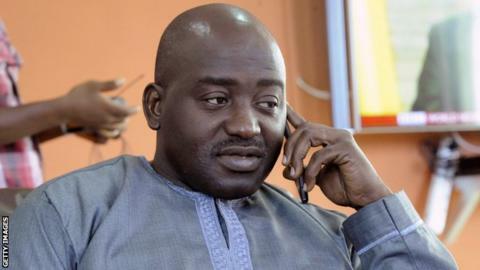 Liberia Football Association chairman Musa Bility has failed to overturn his exclusion from next year's Fifa presidential election. On 12 November, Fifa determined Bility had failed an 'eligibility test'. He appealed to the Court of Arbitration for Sport (Cas) in the hope of being reinstated and repairing the damage he said had been done to his reputation. But on Thursday Cas said in a statement: "All other motions or prayers for relief are dismissed." Cas added that "the full award, with the grounds for the decision, will be issued in early 2016". Bility said he will await to hear Cas' reasons before deciding upon his next course of action but he has no further recourse to appeal. "I am stunned by the decision," he told BBC Sport. "This brings an end our participation in the 2016 Fifa presidential race. "But our struggle to bring more transparency to the worldwide football family will never end and we hope to share more information on the process as things progress. "The Liberian FA will remain an active participant of the process and ensure that its vote counts." Bility was informed by Fifa last month that his candidacy was "principally rejected" because of a six-month ban from all football activities handed out in 2013. The ban was imposed by the Confederation of African Football which ruled Bility had used confidential documents from the governing body in a legal challenge against its president, Issa Hayatou. Hayatou is acting Fifa president after Sepp Blatter, vice-president Michel Platini and general secretary Jerome Valcke were all suspended over corruption allegations. Fifa has approved five presidential candidates, with Platini also not included.